In this edition of Chalk-Talk, we look at a station-based session of competitive ‘game-like’ drills. These drills put players in situations that they will encounter in games – this presents the players with the opportunity to create, problem-solve, read and react and to use the technical skills, tactics and concepts they have learned in practice. 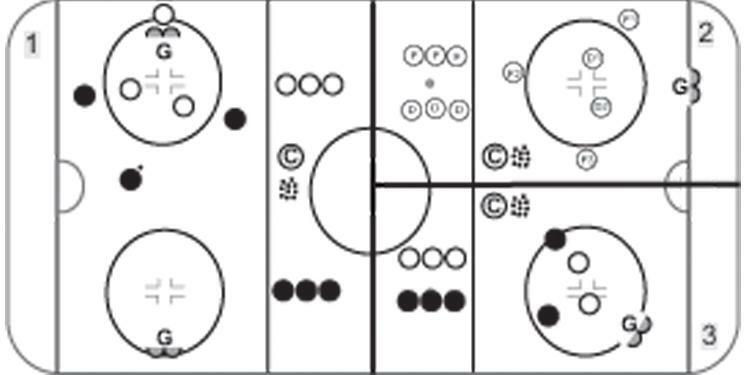 This practice sequence includes three ‘games’ that can be used from Novice to Midget. The following drills are from our recent Under 16 Program of Excellence Mini-Camp as the players and staff prepared for the 2017 OHL Gold Cup. Two teams participated in the ice session including 36 players and 4 goaltenders. Station 1 is set up on one end using the full width of the rink. Station 2 and 3 split the other end in half. Team WHITE has two players defending an a third player behind its net. Team BLACK (3 players) tries to score while Team WHITE (2 players) defends and tries to get possession. Team BLACK makes a line-change and two players come out to face a 3V2 and a third goes behind the net. Team WHITE begins their 3V2 attack immediately.